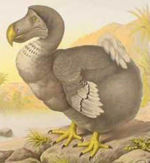 The Dodo, a bird of Mauritius, became extinct during the mid-late seventeenth century after humans destroyed the forests where the birds made their homes and introduced animals that ate their eggs. The Holocene extinction event is a name customarily given to the widespread, ongoing mass extinction of species during the modern Holocene epoch. The large number of extinctions span numerous families of plants and animals including mammals, birds, amphibians, reptiles and arthropods; a sizeable fraction of these extinctions are occurring in the rainforests. This extinction event is sometimes referred to as the sixth extinction following the previous five extinction events. Since AD 1500, 784 extinctions have been documented by the International Union for Conservation of Nature and Natural Resources. However, since most extinctions are likely to go undocumented, scientists estimate that during the last century, between 20,000 and two million species have become extinct, but the precise total cannot be determined more accurately within the limits of present knowledge. Up to 140,000 species per year (based on Species-area theory) may be the present rate of extinction based upon upper bound estimating. In broad usage, the Holocene extinction event includes the notable disappearance of large mammals, known as megafauna, by the end of the last ice age 9,000 to 13,000 years ago. Such disappearances have been considered as either a response to climate change, a result of the proliferation of modern humans, or both. These extinctions, occurring near the Pleistocene / Holocene boundary, are sometimes referred to as the Pleistocene extinction event or Ice Age extinction event. However the Holocene extinction event continues through the events of the past several millennia and includes the present time. The observed rate of extinction has accelerated dramatically in the last 50 years. There is no general agreement on whether to consider more recent extinctions as a distinct event or merely part of a single escalating process. Only during these most recent parts of the extinction have plants also suffered large losses. Overall, the Holocene extinction event is most significantly characterised by the presence of man-made driving factors and its very short geological timescale (tens to thousands of years) compared to most other extinction events. The ongoing extinction event seems more outstanding if we follow tradition and separate the recent extinction (approximately since the industrial revolution) from the Pleistocene extinction near the end of the last ice age. The latter is exemplified by the extinction of the woolly mammoth and, incorrectly, the Neanderthal people. However, modern climatology suggests the current Holocene epoch is no more than the latest in a series of interglacial intervals. Furthermore, there is a continuum of extinctions between 13,000 years ago and now. If only considering human impact, the vulnerability and extinction rate of species simply rises with the increase in human population, so there would be no need to separate the Pleistocene extinction from the recent one. Nevertheless, the Pleistocene extinction event is large enough and has not been resolved completely. The Ice Age extinction event is characterised by the extinction of many large mammals weighing more than 40 kg. In North America around 33 of 45 genera of large mammals became extinct, in South America 46 of 58, in Australia 15 of 16, in Europe 7 of 23, and in Subsaharan Africa only 2 of 44. The South American extinction witnessed the aftermath of the Great American Interchange. Only in South America and Australia did the extinction occur at family taxonomic levels or higher. The animals died off due to climate change: the retreat of the polar ice cap. The animals were exterminated by humans: the "prehistoric overkill hypothesis" (Martin, 1967). The prehistoric overkill hypothesis is not universally applicable and is imperfectly confirmed. For instance, there are ambiguities around the timing of sudden extinctions of marsupial Australian megafauna. Biologists note that comparable extinctions have not occurred in Africa, where the fauna evolved with hominids. Post-glacial megafaunal extinctions in Africa have been spaced over a longer interval. An alternative to the theory of human responsibility is Alexander Tollmann's bolide theory, a more controversial hypothesis which claims that the Holocene was initiated by an extinction event caused by bolide impacts. The Woolly Mammoth became extinct around 12,000 years ago. The survivors are as significant as the losses: bison, moose (recent immigrants through Beringia), elk, caribou, deer, pronghorn, muskox, bighorn sheep, mountain goat. All save the pronghorns descended from Asian ancestors that had evolved human predators. The culture that has been connected with the wave of extinctions in North America is the paleo-Indian culture associated with the Clovis people (q.v. ), who were thought to use spear throwers to kill large animals. The chief opposition to the "prehistoric overkill hypothesis" has been that population of humans such as the Clovis culture were too small to be ecologically significant. Other generalized evocations of climate change fail under detailed scrutiny. In South America, which had remained largely unglaciated except for increased mountain glaciation in the Andes, there was a contemporaneous but smaller wave of extinctions. 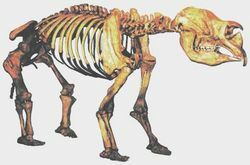 The Diprotodon became extinct around 50,000 years ago. Some extinct megafauna, such as the bunyip-like diprotodon, may be the sources of ancient cryptozoological legends. Ten species of Moa, giant flightless ratite birds. The Moa-nalos, giant grazing ducks from Hawaii. A giant megapode from New Caledonia. the Aepyornis, or Elephant Bird, a giant flightless ratite bird. 14 species of birds on the Mascarene Islands, including the Dodo, the Rodrigues Solitaire, and the unrelated Réunion Solitaire. Significantly, the rate of species extinctions at present is estimated at 100 to 1000 times "background" or average extinction rates in the evolutionary time scale of planet Earth;. Most biologists believe that we are at this moment at the beginning of a tremendously accelerated anthropogenic mass extinction. E.O. Wilson of Harvard, in The Future of Life (2002), estimates that at current rates of human disruption of the biosphere, one-half of all species of life will be extinct in 100 years. In 1998 the American Museum of Natural History conducted a poll of biologists that revealed that the vast majority of biologists believe that we are in the midst of an anthropogenic mass extinction. Numerous scientific studies since then—such as a 2004 report from Nature, and those by the 10,000 scientists who contribute to the IUCN's annual Red List of threatened species—have only strengthened this consensus. Peter Raven, past President of the American Association for the Advancement of Science, states in the foreword to their publication AAAS Atlas of Population and Environment: "We have driven the rate of biological extinction, the permanent loss of species, up several hundred times beyond its historical levels, and are threatened with the loss of a majority of all species by the end of the 21st century." The reasons for the current mass extinction are all human related and include deforestation and other habitat destruction, hunting and poaching, the introduction of non-native species, pollution and climate change. 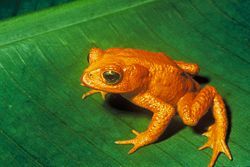 The Golden Toad of Costa Rica, extinct since around 1989. 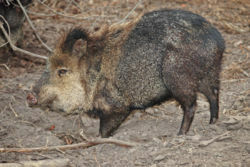 Its disappearance has been attributed to climate change. Evidence for all previous extinction events is geological in nature, and the shortest scales of geological time are in the order of several hundred thousand to several million years. Even those extinction events that were caused by instantaneous events — the Chicxulub asteroid impact being currently the demonstrable example — unfold through the equivalent of many human lifetimes, due to the complex ecological interactions that are unleashed by the event. There was a limited debate as to the extent to which the disappearance of megafauna at the end of the last ice age can also be attributed to human activities, directly, by hunting, or indirectly, by decimation of prey populations. While climate change is still cited as another important factor, anthropogenic explanations have become predominant. There is still hope, argue some, that humanity can eventually slow the rate of extinction through proper ecological management. Current socio-political and overpopulation trends, others argue, indicate that this idea is overly optimistic. Many hopes are set on sustainable development and conservation. 189 countries which are signatory to the Rio Accord have committed to preparing a Biodiversity Action Plan, a first step at identifying specific endangered species and habitats, country by country. ^ Anthony D. Barnosky, Paul L. Koch, Robert S. Feranec, Scott L. Wing, Alan B. Shabel. "Assessing the Causes of Late Pleistocene Extinctions on the Continents". Science 306 (5693): 70-75. ^ MacPhee, RDE (1999). Extinctions in Near Time: Causes, Contexts, and Consequences. Kluwer Academic Publishers. ISBN 0306460920. ^ Diamond, J. (1997). Guns, Germs, and Steel: The Fates of Human Societies. WW Norton. ISBN 978-0393061314. ^ Pielou, EC (1992). After the Ice Age: the return of life to glaciated North America. University of Chicago Press. ISBN 978-0226668123. ^ Study sees mass extinctions via warming. MSNBC. URL accessed July 26, 2006. Leakey, Richard and Roger Lewin, 1996, The Sixth Extinction : Patterns of Life and the Future of Humankind, Anchor, ISBN 0-385-46809-1. This page was last modified 14:49, 28 November 2007.